Is tuition in Europe really US$300 or €200 a year? That is one tenth the cost of the tuition in the developing country university where I took my bachelor's and master's. Is it really true that some developed country universities charge that much to non-scholars? Why? I heard of universities like that, but everyone who goes to such university is considered a scholar of his/her state due to such universities being heavily funded. Is that the case? Does Europe invest a lot in education, or something? I find it very hard to believe. How do people get paid? The school has to consider food, maintenance, utilities, salaries of janitors, funding researchers and professors, etc. Yes European higher education can be fairly cheap for the students, especially in those countries where universities are mainly public, and hence are largely funded by their respective governments. This means that they do not need to charge high fees to their students to cover for costs. Nevertheless their campuses offer all the facilities their students need, in terms of libraries, food canteens, lecture rooms, laboratories, etc..
Just read OECD statistics. 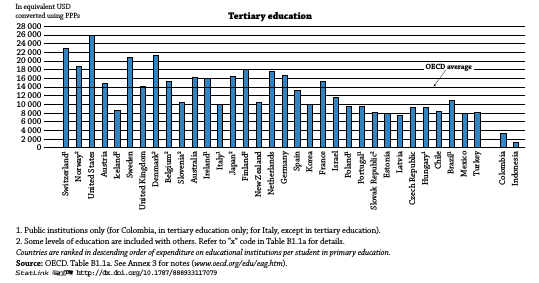 "Underdeveloped" countries are not in OECD, but they presumably spend less per student and charge more because they can't afford public investment (or vice versa, they don't invest so they're underdeveloped). First chart. The average expense per student per year in OECD is about 14000 USD (in tertiary education ~ university). 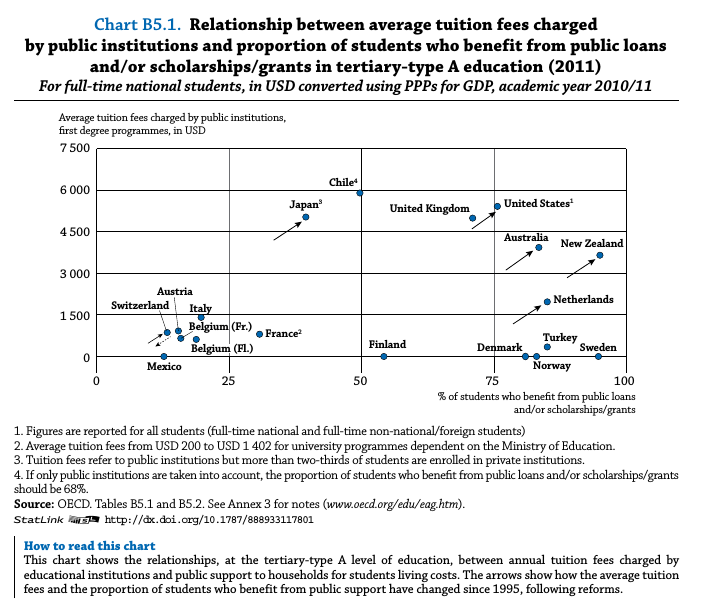 Second chart: there are mainly three groups of countries when it comes to tuition fees and student support (which must be considered jointly). Some countries (bottom) like Sweden are heaven, with zero tuititions and high support for students. Some (left-bottom) are tougher, with near-zero student support even though there are costs (worst is Italy). Some (like New Zealand) have considerable costs but nearly everyone is supported by the State. Fees don't cover costs in any country (Chile is around 80 % and that's the highest). I did not find a chart including opportunity cost and cost of life, which are actually the biggest share of university costs in most countries. There already a number of answers confirming that indeed academic education in Europe is often very cheap compared to the US, mainly because these are funded by the government. However, one point which is not mentioned in other answers is that you might want to consider indirect cost, or in other words - taxes. In many European countries, you pay more tax to the government than you would pay in the US, and in turn the government can then use that to fund academic studies, provide cheap healthcare, and so on. "In Europe" may be too broad; there are different models. I'll give you another data point. you will have to pay for material (pen and paper, books, computer, lab consumables, ...) but can write these costs off after you graduate, i.e. reduce your taxable income. So, you won't be able to study for free, literally, but the university itself runs without you paying a dime -- the society pays for it. At least not EU citizens that pursue their first academic grade and finish within reasonable time bounds. Yes. The fees for the domestic students in European/Australia/New Zealand universities are very nominal. In some countries such as the UK, Australia, New Zealand, etc., the fees are 3-4 times higher for the international students compared to the domestic students. The domestic students' education can hence be viewed as subsidised by their respective governments. One way of looking at it is that at least the domestic students in these countries may not have to be away from education only because of the financial (read: fees - living expenses is a different issue and perhaps not all governments may be helping in it) reasons. Or, to some extent (for students who are still early on their life/career), ability of getting higher education doesn't depend on how well their parents are doing. I should also mention that in the UK some of the recent fees hikes by the universities haven't gone well with the domestic students. However, even with these fee hikes, the levels are still significantly lower than the US counterparts. It is just the US (and probably Canada) where even state universities charge ridiculous fees most of the times to their domestic students. In the US, the domestic students may be able to take loans to cover the fees and living expenses. However, it is a loan and someday you have to pay it back. Academically, there is no significant difference between the US and Europe/Australia/NZ universities. e.g., no. of universities top 500-1000 ranked universities per capita could very well roughly be the same for all these countries including US/Canada. e.g., all the total 8 universities in New Zealand are in top 500 of the QS World University Rankings. According to this page -- http://nces.ed.gov/FastFacts/display.asp?id=76 -- the average cost per year at a private, non-profit U.S. college (i.e. not state subsidized) is $39,000. That includes tuition plus room and board. Let's compare that to Germany, just to pick one European country as an example. According to this page -- http://www.marketplace.org/topics/education/learning-curve/how-german-higher-education-controls-costs -- the average cost of a year at a German college is $32,000. That's what the government spends: it's free to the student. This comparison is not entirely fair as the number for Germany does not include room and board, and even private U.S. schools get government money in various ways that is not included here. But from this admittedly very simplistic comparison, it appears that the true cost of education in the U.S. and Germany is about the same, at least in the same ballpark. Of course you could debate the quality of the education received endlessly: that's not easy to measure. Where does the money come from in Germany? From taxpayers. Where does the money come from in the US? From a mix of the student and his family, government assistance, and private scholarships. Most American students borrow most of the money and pay it back after they graduate. So higher education in Germany is free in the sense that the student doesn't have to pay at the time he attends. But he ends up paying for it through his tax dollars for the rest of his life. As the total cost is about the same, he's going to end up paying about the same amount in extra taxes as the American spends in tuition. There's less practical difference between the two systems than you might at first think. In Germany students pay nothing while attending school, but then pay for it through taxes for the rest of their lives. Maybe 40 years from graduation to retirement? In America most students pay little or nothing while attending school, but then pay for it through student loan payments for an average of about 20 years. Poverty doesn't keep a German out of school because it's paid for by the government. But low income Americans can get all sorts of financial assistance and then get loans to pay the rest, so poverty isn't that much of a bar to education in the U.S. either. You could debate the pros and cons endlessly. The German spreads his payments out over his entire life while the American concentrates it into 20 years. The American may find himself unable to make his debt payments if he can't find a good job, etc, while the German's taxes are presumably based on his income so while he may complain it should still be manageable. The American can decide how much he is willing to spend for college, while the German cannot decide how much he will pay in taxes to support education. In Germany if you can't pass the entrance requirements, you're out of luck. In the U.S., if you can't pass entrance requirements you can't get into your first choice school, but you can almost always get in somewhere. A German who isn't admitted into college still has to pay taxes for others to attend, while an American who doesn't attend college doesn't have to pay for it. (Well, he still has to pay taxes to support the various government programs that exist, but these are much less than what the German pays.) Etc. I'm sure you could think of other pros and cons. Yes, the education in Europe is pretty cheap. The school does not have to worry about the finances as they are taken care of by government funding. As a foreigner, I paid less than 4K Euros in Netherlands for my MSc tuition fees. I know that this is the case in Germany and France. In France, government pays some allowance to students for transportation and lodging costs. In Germany tuition fees is almost zero (My data is from 2009, things may have changed now). Some countries prefer to directly charge students (tuition fees), other charge the active population through taxes. It might depend on many other factors, e.g. the field. The time price of health care has quadrupled in less than 50 years [in the U.S.] even as the time cost of other goods and services plummeted. I'm amazed it's that cheap in the US and other European countries. Here in the UK it's a different story. According to recent figures, the average cost per year to study in the UK at undergraduate level as an international student is UK£11,987 (~US$17,860), while for international postgraduate students this average fee rises to £12,390. At all levels, laboratory and clinical degree programs are markedly more expensive, with a clinical degree costing overseas students an average of £24,206 ($36,070) at undergraduate level, with top universities in London charging as much as £34,800 ($51,850). Combine these fees with the average cost of living in the UK, around £12,000 ($17,850), and the total average costs to study in the UK come up to £24,000 ($35,710) per year. Studying in the capital city, meanwhile, is likely to be significantly more expensive. Although that's somewhat simplifying it, I believe it's cheaper in Scotland. Don't ask me why though. Not the answer you're looking for? Browse other questions tagged university europe tuition or ask your own question. 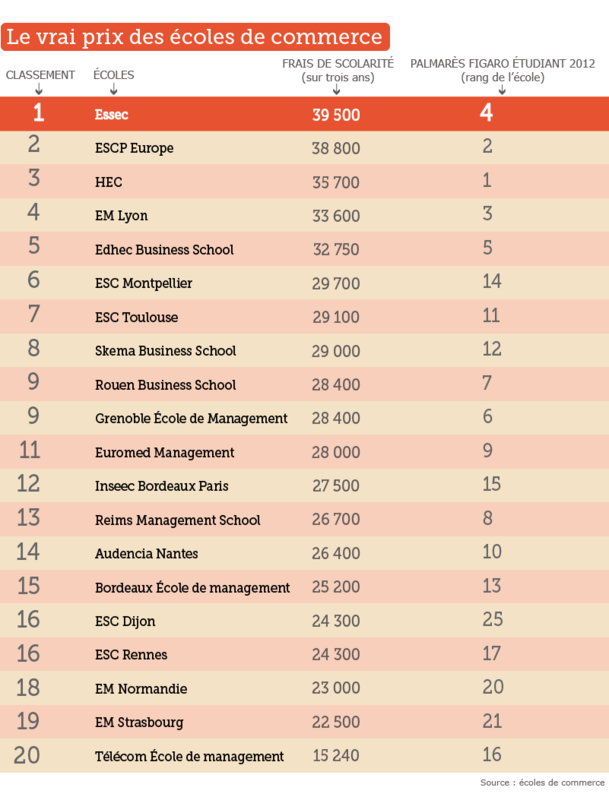 What are the best CS PhD programs in Europe? Is it possible to do a cheap or free online or distance Ph.D. program? What's the equivalent of this degree in Europe and USA? Starting a PhD in Europe around March?